These units were a gift to Malaya under the Colombo Plan. Manufactured by Hitachi Ltd. Japan. Manufactured by Brush HMA , Hull , England , United Kingdom. 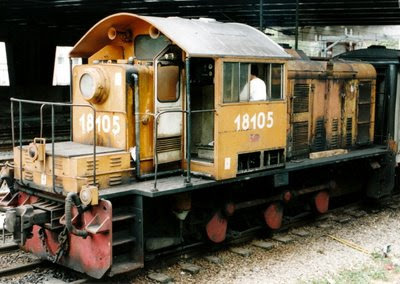 These locos were originally allocated the series 152.01-6. It is not known whether they were delivered with these numbers, but works photos were taken with the 152-series plates. NOTES: The locomotives were built by North British Locomotive Company (order L50 of 1952) at its Queens Park works and allocated works numbers 27482-487. Additional details are given in "Locomotive Centennial" by Haji Shamsuddin, published in Malaya in 1985. Painted olive green, the locomotives were delivered in 1954. The 16 class was powered by vee-form 6RPH engines driving Voith-North British L24V Hydraulic Torque Converter Transmissions. Total weight was 36 tons with a 12.25 ton maximum axleload which was kinder on wharf areas than the (English Electric) 15 class. 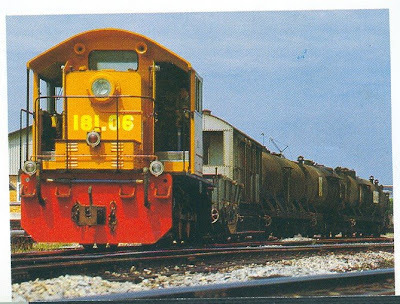 All six locomotives remained at Swettenham for some years until the completion of the Port Dickson refinery complex when they were sent to service that area. 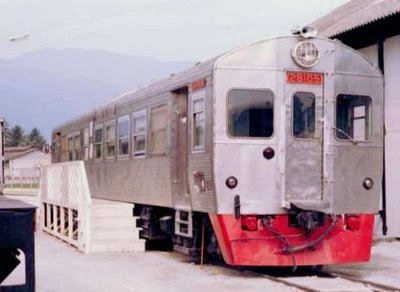 They remained at work until 1980 and one has been sent to the Railway Museum, the other five were cut up in December 1984 at Sentul Workshop. 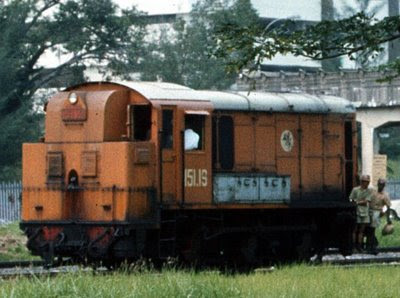 These powerful diesel shunters were the first diesels to operate on KTM. They soon displaced older steam types from shunting duties, and gave upwards of 40 years reliable service. Inilah permainan simulator utama penulis sepanjang mengenali games Trainz ini selain daripada siri pelbagai - Command & Conquer dan Microsoft Train Simulator.Penulis mula bermain dari siri UTC pada tahun 2002 sehinggalah kepada Trainz Railroad Simulator 2006 dan menunggu sehingga kini siri terbaru iaitu TS 2009 Disember ini. Berikut adalah siri simulator terbitan AURAN sejak 2001. Trainz version 1.0 (Community Edition) - released in December 2001. Trainz version 1.1.1 (Retail Edition) - released in January 2002. Ultimate Trainz Collection (UTC ) released in November 2002. Trainz Railroad Simulator 2004 - released in September 2003. Trainz Railroad Simulator 2006 - released in September 2005. 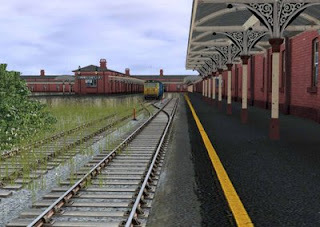 Trainz Railroad Simulator 2009 - December 2008. 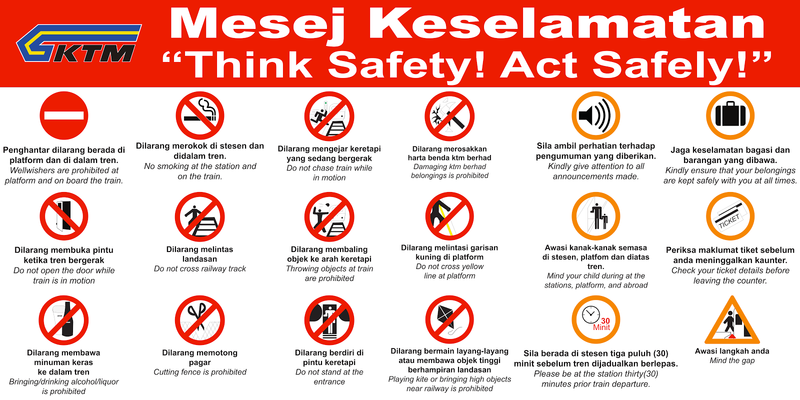 - edisi untuk untuk membina dan operasi simulasi keretapi. - edisi untuk pemandu lokomotif yang lebih realistik. Walaubagaimanapun pemasangan (install) kedua-dua siri ini adalah serasi dan saling melengkapkan antara satu sama lain.Sementara itu banyak juga ciri baru yang dibangunkan oleh Auran seperti resolusi tekstur yang lebih baik dan kemas , signalling optimise , menyokong siri sebelum 2009 (99%) dan berbagai lagi , lawat web Trainz di sini. IPOH 1 Dis. 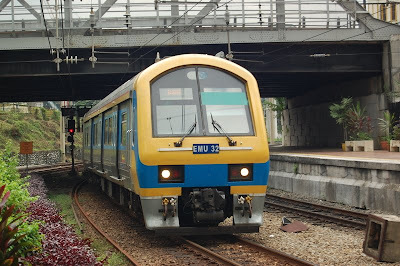 - Keretapi Tanah Melayu Berhad (KTMB) menawarkan promosi tambang RM1 untuk perjalanan sehala perkhidmatan kereta api Kuala Lumpur-Ipoh dan Ipoh- Kuala Lumpur mulai hari ini sehingga 31 Disember ini. Pengurus Pemasarannya, Mohd. Noordin Kimi berkata, tambang murah itu merupakan promosi KTMB sempena tempoh percubaan perkhidmatan kereta api bagi laluan tersebut. Promosi itu terhad kepada 400 tiket sehari dan untuk penumpang kelas ekonomi sahaja. ''Seratus 100 tiket pada harga RM1 disediakan untuk setiap perjalanan pertama pada pukul 5 pagi dan perjalanan terakhir pada pukul 9 malam dari kedua-dua arah. ''Hanya pengguna yang membeli tiket di kaunter Stesen Keretapi Ipoh dan Stesen Kuala Lumpur Sentral layak mendapat tawaran tambang RM1 ini dan tempahan tidak dibenarkan," kata Mohd. 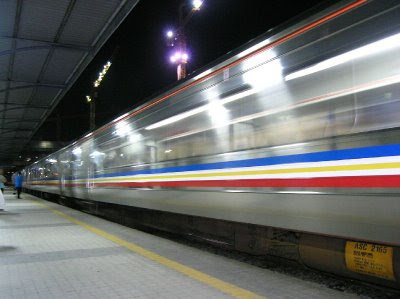 Noordin kepada pemberita selepas mengiringi kira-kira 180 ahli rombongan tajaan KTMB dan Bank Simpanan Nasional (BSN) menaiki kereta api dari Kuala Lumpur ke sini. Menurut Mohd. Noordin, walaupun perkhidmatan kereta api untuk laluan Kuala Lumpur-Ipoh baru bermula hari ini, sambutan yang diterima daripada orang ramai sangat hebat dan di luar jangkaan. Incredible, but true. For just as low as RM2, a commuter can travel from Ipoh to Kuala Lumpur and return on the new Express Shuttle Train Service to be launched on Dec 1. 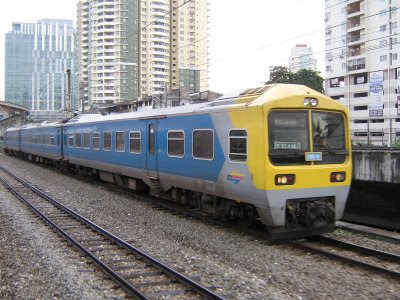 Keretapi Tanah Melayu Berhad (KTMB) is offering the low fare on a month-long promotion to mark the launching of its Ipoh-KL Sentral intercity rail service. However, the RM1 one-way tickets are valid only for those travelling on the first daily scheduled train out of Ipoh and return on the last train. There are only 100 tickets available each day. This rapid intercity rail link is being made possible due to the completion of the long delayed double-tracking and electrification project. It offers a new option to commuters in Perak in need of a convenient way to travel to KL. The less than three-hour journey takes commuters right into the heart of Kuala Lumpur without having to worry about traffic jams. "Initially, there will be 10 shuttle services a day," said Sabri Muhamud, KTMB’s operations and marketing executive. "Five shuttle services from Ipoh and five from KL Sentral." The daily departures to KL Sentral are set for 5am, 9am, 1pm, 5pm and 9pm, while departures from KL Sentral to Ipoh are at 5am, 9am, 1pm, 5pm and 9.45pm. 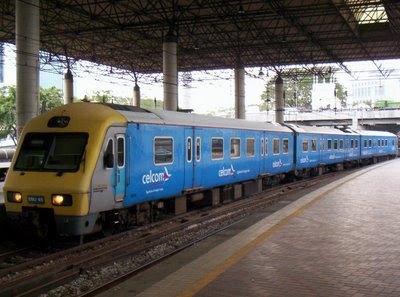 The four-coach trains will stop for one minute each at Batu Gajah, Kampar, Tapah Road, Sungkai, Slim River, Behrang, Tanjong Malim, Kuala Kubu Baru, Rawang, Sungai Buloh and Kepong Sentral for passengers to disembark or get on board before proceeding to Kuala Lumpur Railway Station and KL Sentral. 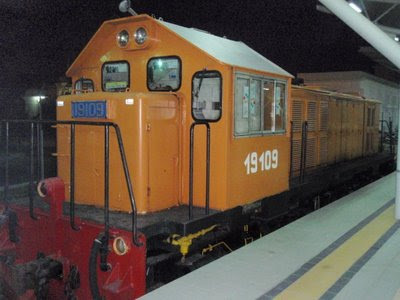 The fares from Ipoh to KL are RM18 for second class and RM10 for economy class. No discount is given to children or senior citizens. The double-tracking and electrification project was undertaken in 2000, but was delayed due to contractual disputes. It is an extension of the track from Rawang to Ipoh. Under the project, various smaller railway stations along the route were also rebuilt. Ipoh Railway Station, which combines Moorish architecture with modern embellishments, has also been extensively renovated to include two overhead pedestrian bridges with escalators to link the new and longer platforms.